1. Wash and steam spinach leaves. Drain them completely, so that all water is drained. If there is water then the paste becomes thin and you will have trouble coating the kofteys with it. Dry roast besan in a thick bottom pan, till golden brown. Then sieve it. Grind drained spinach leaves into a fine paste and add roasted besan to it. Add salt and & 1 teaspoon of red chilli powder. Set aside. 2. Grate cottage cheese, add salt, ¼ teaspoon of turmeric powder and black pepper to it. Mash it well to form a soft dough. Take 1 teaspoon of paneer dough in your palm and spread it flat, place 1 raisin on the flattened paneer. Gently fold the paneer into a ball, with single raisin in the center. Make balls for the entire dough and set aside. 3. Grate or mash boiled potatoes, add salt, 1 teaspoon of red chilli powder and ½ teaspoon of coriander powder. Mix it well. Dampen your palm lightly. Take 1 tablespoon of potato masala in your palm and flatten it. 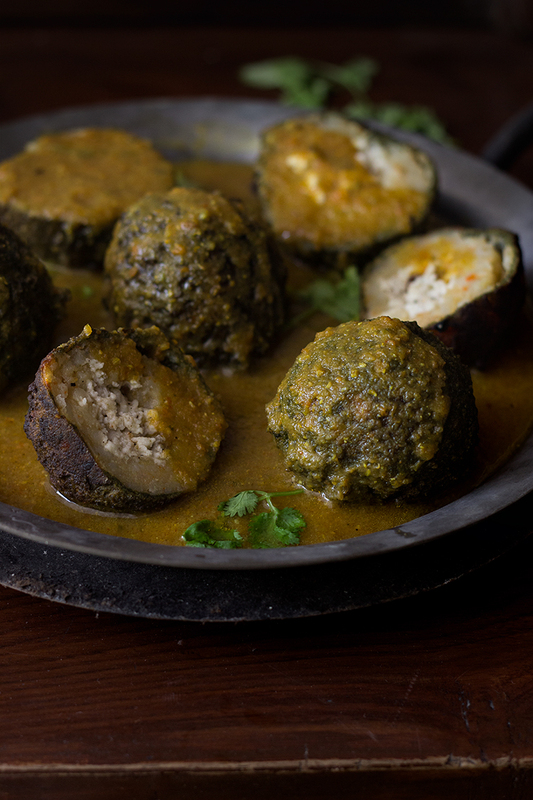 Now place one paneer ball on the flattened potato and gently fold the potatoes into a ball, with paneer ball in the center. Make balls for the entire dough and set aside. 4. Now coat all the balls in spinach-besan paste and deep fry them. Set aside. 5. For the gravy, grind ginger, onion, and tomatoes. Heat 1 tablespoon of oil in a thick bottom pan, and roast the onion paste till oil separates. Add salt, remaining red chilli powder, turmeric powder and garam masala. Gently roast the masalas. Add 1 cup of water to the gravy and allow it to boil for 2-3 minutes. Allow the gravy to cook for few minutes on slow flame. When ready to serve, slice the koftas in half and place them in a bowl and pour hot gravy on top. Keep it covered for 5-10 minutes to allow the koftas to absorb the flavour of the gravy. Granish with grated cheese, cashewnuts, cream, etc. Serve hot with paranthas or naan. You may need to add more besan to spinach if there is water to thicken the consistency. You may need to slightly damp the palm before making paneer and potato balls, to avoid paneer or potato sticking to your fingers or palms. You can prepare the balls a day in advance and make gravy at the time of party too.